The old Post office. The building was purpose built in the mid 1930s on land previously belonging to the church which owned almost all the land between the Church and Bolters Lane. 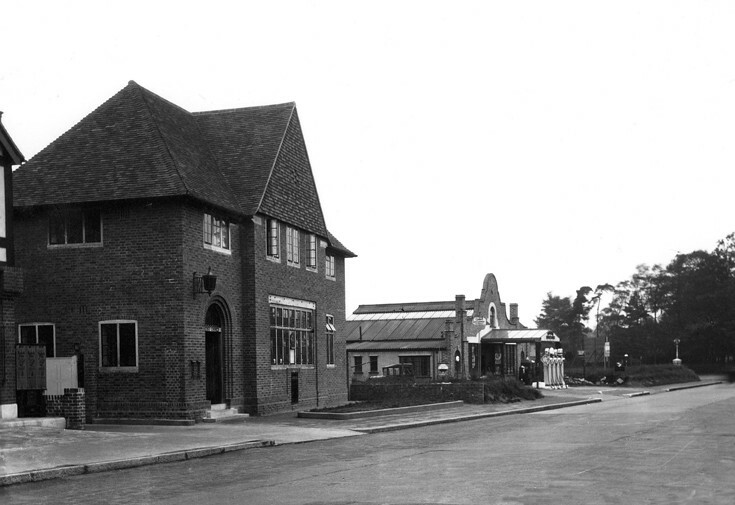 The land for the post Office was sold in 1933 and the Post Office opened in December 1934. Note the petrol station next door and the lack of buildings past that at the western end of the High Street. The building was turned into The Post restaurant owned by Tony Tobin of Ready Steady Cook fame. That was around 2007. Since then it has changed hands again and is now PEZZO. When first opened, the new Post Office must have seemed very luxurious to the people in the village; there were a few steps up from the pavement to lead one in through the almost temple-like entrance. Even when closed, the strong wooden door had a solid and official look about it. The garage was known as "Watkins Service Garage". I don’t know why this building was so large, except I think it included a sorting office. If I recall correctly, you entered up the steps and then turned right through a pair of double doors, the main part of which were wire reinforced glass. The counters were then on your left of a spacious room, and the big block of windows on the front of the building let in the daylight. I seem to recall the interior was a pale green. I am not sure if the two windows with the open fanlights were in a separate room. Note that in the middle windows of the block there is a clock and below that (showing white) is a list of collection times. In the wall below these is the post box. I think also you could put post into this same letter box from inside the building. Also note that on the wall to left of the main entrance are two postage stamp dispensing machines. The stamps were in the machine in a single perforated coil, and putting the appropriate coins in a slot turned the mechanism holding the coil of stamps allowing one to protrude through another slot so that a stamp could be torn off along the perforations. Some wall mounted machines issued small booklets of stamps rather than individual ones. The end of the High Street remained very similar up to the early 1950’s. The silvery structure towards the right of the picture is a street light with two bulbs at each end of the “T” on the top. I am not sure precisely what the large structure under the pole was; presumably power transformer(s), but probably not just for the lights. There was a similar one on the verge of A217 Brighton Road a few yards south of its junction with Tattenham Way, and this was the only street lamp on this road between Burgh Heath and the Wheatsheaf! There was a large sorting office behind the main building. When I was 16 (in 1947)I did deliveries in the Christmas holidays, we had very heavy snow and I took my sledge on a post van to the top of the road in Woodmansterne Village (Chipstead Way) which stretched from the shops in the village to Chipstead Valley Road. The snow was very deep and the trip took about three hours to complete.